The Team. 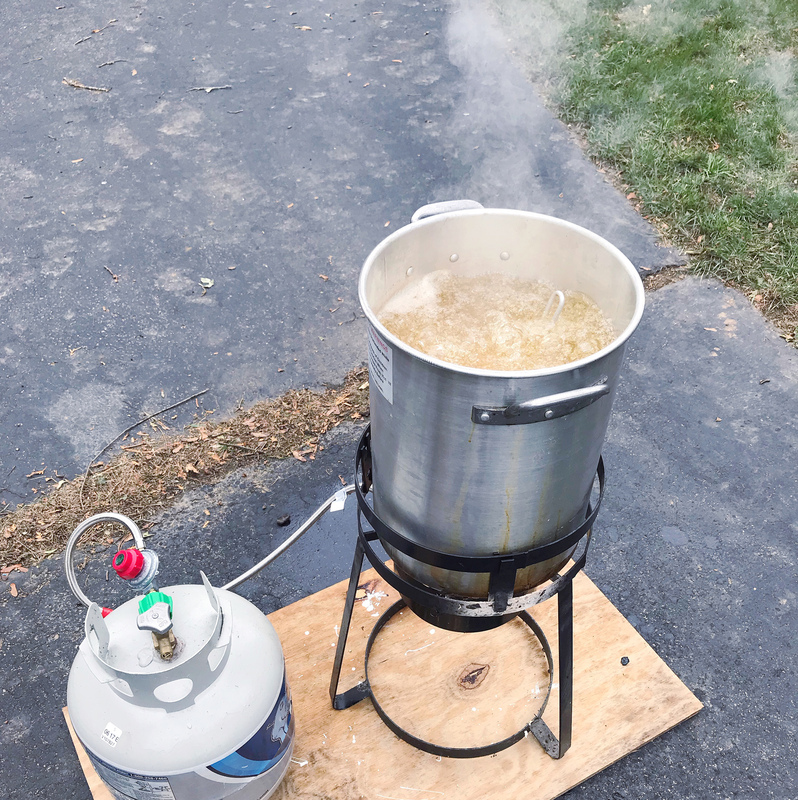 Before I dig into any of the tools or techniques, I’ll start with this tip: turkey frying is a team sport. I would never do this alone, quite simply because I couldn’t do it alone! It turns out, I don’t think I’m even tall enough to lift the turkey above the fryer and slowly drop it in. My husband was chief-turkey-fryer for this mission and I was the assistant (being super helpful and taking pictures for this blog post, and standing by with a fire extinguisher in case things went south). Having an extra set of hands was key for safety, as well as for checking the temperature of the bird when it came out of the oil. It’s also nice to have the company, because you shouldn’t leave the fryer unattended, and the whole process took a little over an hour of standing outside watching the pot. The Tools. 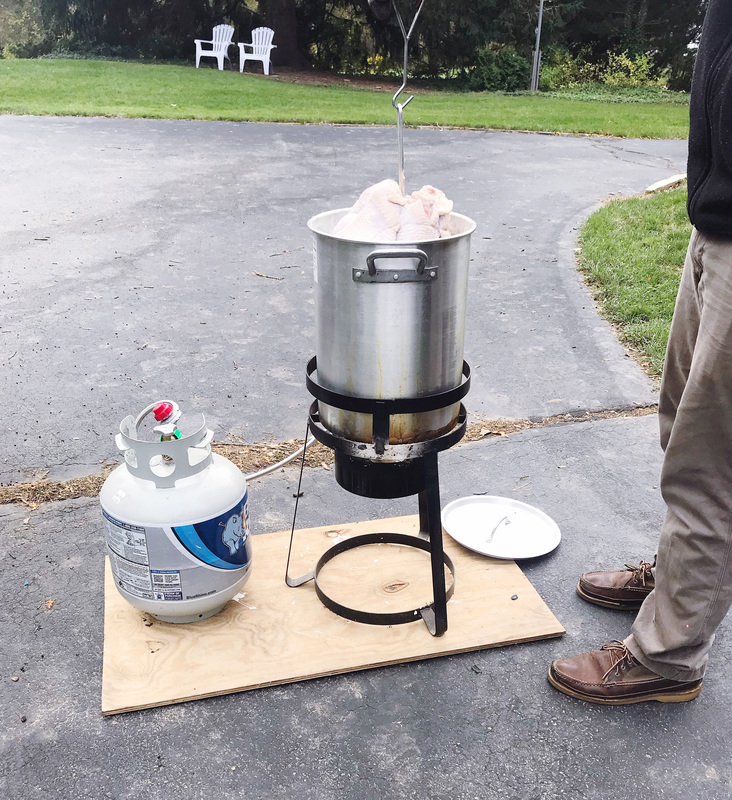 The turkey fryer itself is a pretty standard apparatus that you can find around the Thanksgiving season. It’s a large pot with a sturdy metal stand that holds a propane burner, and it hooks up to the same type of propane tank you’d use for a gas grill. Inside the pot there is a stand to hold the turkey and a hook to help lower and remove the turkey from the hot oil. We purchased ours with the intention of using it for lobster bakes, so it does have a few other uses in the year if you’re thinking of investing in one. In addition to the actual fryer, make sure you have a full tank of propane to heat the oil. A few other things to have on hand: a fire extinguisher (just in case! ), a long thermometer for checking the oil temperature (make sure it goes up to at least 400 degrees), oil for frying, and a really good set of oven or grill mitts to protect your hands. My husband actually used our extra long and durable fireplace gloves, which worked really well. 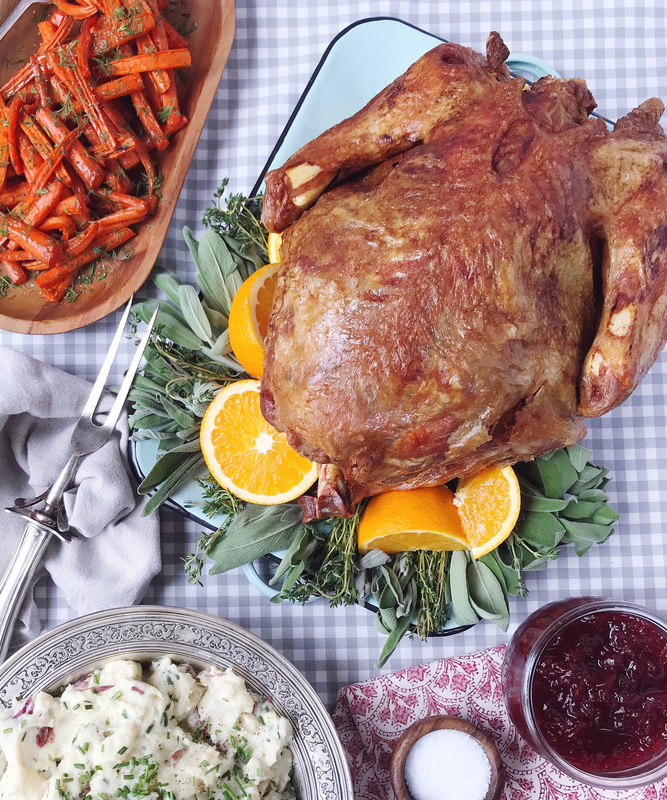 You’ll also want to have a roasting pan or serving platter big enough for to hold the turkey once it’s done. The Prep. 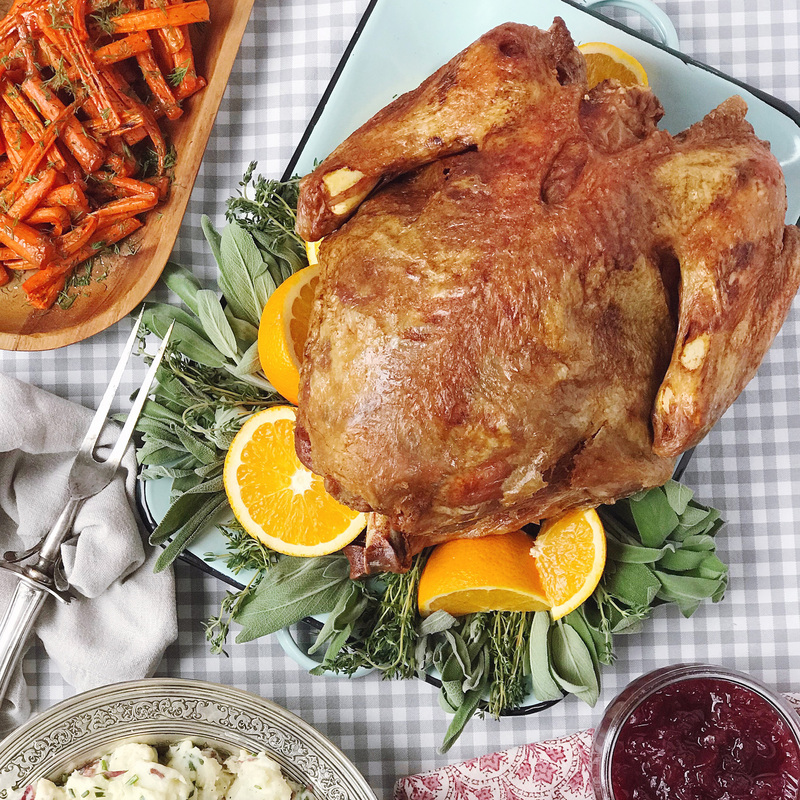 The prep for any turkey, frying or not, is probably just as important as the actual cooking process. First thing is first: the turkey needs to be thawed if it’s not fresh. This is super important if you’re frying the turkey because even the tiniest bit of ice inside the bird can create a huge splash back when it hits the hot oil and that’s how most of those scary YouTube turkey-fryer disasters happen. So plan a few days in advance to make sure the turkey is thawed.thawed.thawed. Next on the prep list is brining, which is essentially flavoring the turkey and helping to keep it from getting dried out during the cooking process. I’ve done lots of reading on the dry brine vs. liquid brine topic, and for frying; I decided to go with the liquid one. More than 24 hours in advance of frying we filled up a brining bag with 1 cup of salt, 1 cup of sugar, ½ cup of whole black peppercorns and about 6 bay leaves. Then we put in the turkey and filled the bag up with water to fully cover it, and then let the whole thing hang out in a big covered bucket (with ice in the bottom to keep it chilled since it likely won’t fit in your fridge). After about 24 hours of brining, we took the turkey out of the brining solution and gave it a good rinse. This step is important to remove any sugar or salt from the skin of the bird, if you skip this step the skin will burn in the fryer and you’re going to have a charred bird! To rinse the bird, we put it in the fryer pot and filled the pot with fresh water to fully cover it. This gets the brine solution off the turkey, and is also an important step to measure how much liquid you need in the pot for the actual frying. Remove the turkey and note how much water was in the pot to account for the bird displacing the liquid. Use this amount when you’re ready to add oil to the pot for frying. The last step is to thoroughly dry the bird. We mounted the turkey on the frying stand and rested it in a roasting pan in the fridge to let it dry out, and then gave it a final pat down with some paper towels (inside and out!) to remove as much liquid as possible from the skin and inside cavity. Drying the bird is important for two reasons: 1) it helps the skin get extra crispy, and 2) oil and water don’t mix, even a tiny bit of moisture can cause splashes of oil to pop up out of the pot which can lead to burns or a fire starting. The Frying. We set up our fryer in the middle of our driveway and filled it up with the oil level we measured earlier to account for the displaced bird. As a note: our driveway is a bit slanted and we used a large board to create a stable, level spot for the fryer to stand on. In an ideal situation we wouldn’t have put it on a wood board, but keeping the fryer stable to prevent from tipping over was a priority and we had a fire extinguisher on hand in case of a fire. Once the oil was in we patiently waited for the oil to heat up to 350 degrees. It probably took about 30 minutes to get to the temperature we needed. Then came time to carefully and slowly lower the turkey into the oil. When my husband did this part, he briefly turned the propane tank off so that in case there were any splashes of oil, the open flame would be off and hopefully prevent grease fires. Good news: no fires! It dropped in with a few splashes despite taking all of the precautions of thawing and drying it out, so no matter how safe you think you’re being just remember that frying a turkey is definitely still dangerous. It’s recommended to cook the turkey for about 3 minutes per pound. We had a 14lb turkey and it cooked in about 45-50 minutes; check the internal temperature with a long meat thermometer. The goal is to get the turkey to an internal temperature of about 165 degrees, and then remove it from the oil and let it rest for 20-30 minutes before serving. The result: a moderately stressful experience in dangerous cooking techniques, an oven cleared for warming other side dishes, and a really crispy and juicy turkey that was cooked in under an hour. I may even look forward to the turkey on plate this year knowing how tasty a fried turkey can be! Please note: This was post was created in partnership with Peapod. Thank you for supporting brands that support this site! Chocolate Ginger Snap Marshmallows (and a Giveaway!) Thanksgiving Leftover Pot Pie.